This review by Robert Loerzel originally appeared in Pioneer Press. 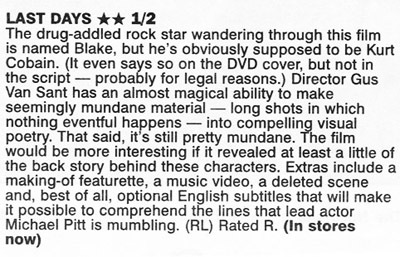 The drug-addled rock star wandering through this film is named Blake, but he’s obviously supposed to be. Kurt Cobain. (It even says so on the DVD cover, but not in the script — probably for legal reasons.) 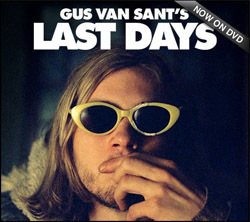 Director Gus Van Sant has an almost magical ability to make seemingly mundane material — long shots in which nothing eventual happens — into compelling visual poetry. That said, it’s still pretty mundane. The film would be more interesting if it revealed at least a little of the back story behind these characters. Extras include a making-of featurette, a music video, a deleted scene and, best of all, optional English subtitles that will make it possible to comprehend the lines that lead actor Michael Pitt is mumbling. 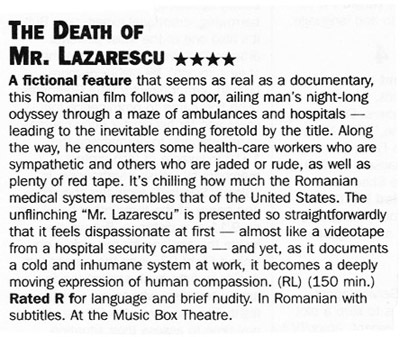 A fictional feature that seems as real as a documentary, this Romanian film follows a poor, ailing man’s night-long odyssey through a maze of ambulances and hospitals leading to the inevitable ending foretold by the title. Along the way, he encounters some health-care workers who are sympathetic and others who are jaded or rude, as well as plenty of red tape. 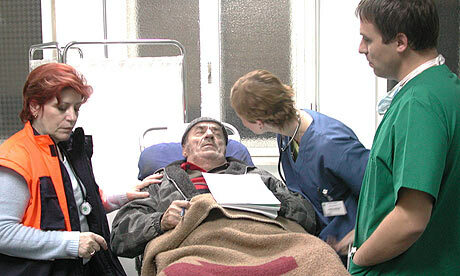 It’s chilling how much the Romanian medical system resembles that of the United States. The unflinching “Mr. Lazarescu” is presented so straightforwardly that it feels dispassionate at first — almost like a videotape from a hospital security camera — and yet, as it documents a cold and inhumane system at work, it becomes a deeply moving expression of human compassion. The old “Thin Man” mystery-comedies starring Myrna Loy and William Powell as debonair sleuths are the epitome of breezy old-style Hollywood entertainment. Each one feels like a visit with old friends, so it’s natural to want more. 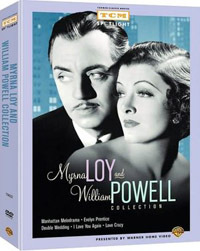 As it happens, Loy and Powell shared screen time in an additional eight films, five of which are collected in a new box set from Turner Classic Movies. “Thin Man” fans may be a little disappointed with their other films, however. The movies are diverting enough, thanks to the irrepressible personalities of these witty, charming stars, but the scripts are uneven and, at times, downright stilted or silly. The silliness actually works in “Double Wedding,” a delightfully daft comedy with Powell as a bohemian eccentric wooing Loy as an uptight businesswoman. “Love Crazy” is also fairly amusing, with Powell pretending to be insane to stop Loy from divorcing him. The amnesia plot in “I Love You Again” is forgettable, however, while the less comedic “Evelyn Prentice” and “Manhattan Melodrama” (the movie John Dillinger was watching before he was shot at the Biograph Theatre) are so melodramatic you can almost hear the plots creaking. Six years after it was made, this masterpiece of surrealism by iconoclastic Hungarian director Bela Tarr is finally available on DVD in the U.S., thanks to Chicago’s Facets Video. In this gorgeously filmed black-and-white epic, peculiar and menacing events happen for reasons never fully explained. A “circus” comes to town, but it’s nothing more than a corrugated-metal trailer with the carcass of a whale inside. Rumors abound of a powerful “Prince” who is behind the scenes, his speeches rousing people to violence. A mob gathers and finally erupts into violence, attacking a hospital. Viewers looking for a logical plot may be frustrated, and the slow pace requires patience. 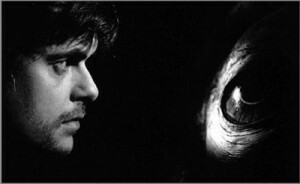 At a Chicago International Film Festival screening a few years ago, someone asked Tarr what all of the symbols meant; he bluntly replied, “There are no symbols. There is only what you see on the screen.” That answer may sound facetious, but in a sense, he’s right. Against the backdrop of a place ravaged by Nazism and Communism in the 20th century, this is a film about how seemingly meaningless events can cascade into mass hysteria, paranoia and authoritarianism. 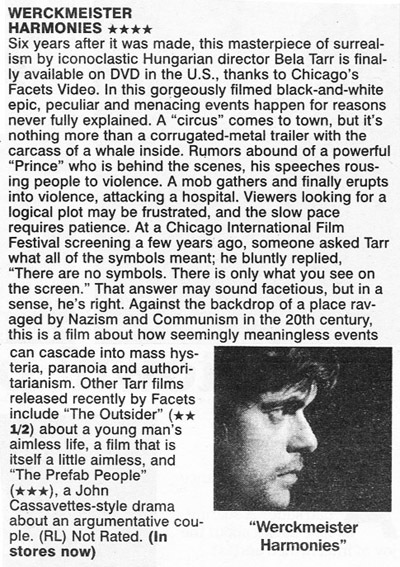 Other Tarr films released recently by Facets include “The Outsider” (**½) about a young man’s aimless life, a film that is itself a little aimless, and “The Prefab People” (***), a John Cassavettes-style drama about an argumentative couple. Director Jonathan Demme keeps up a fever pitch in this delirious nightmare of political paranoia, but despite some compelling action, it’s never as convincing as John Frankenheimer’s version from 1962. The original must have seemed joltingtly surreal when it first came out, and even now, viewed as a relic from the Cold War, it casts an eerie charm. What seemed original 42 years ago feels like cliché in this remake. This time around, the Gulf War provides the backdrop, but the story is still about some soldiers who were brainwashed. 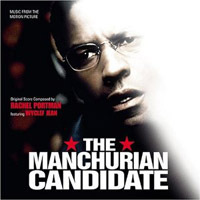 Denzel Washington is desperately trying to figure out what really happened out in the desert, and he has a bad feeling about his old war buddy, played by Live Schreiber, who’s running for vice president under the guidance of his witchy senator mom, Meryl Streep. Some aspects of the story are no longer as believable as they were in the 1960s. Would all of these weird happenings, not to mention the VP candidate’s peculiar personality, really escape the media’s scrutiny during the middle of a presidential campaign? Where’s the Drudge Report when you need it? Despite the film’s flaws, the strong cast keeps things entertaining.